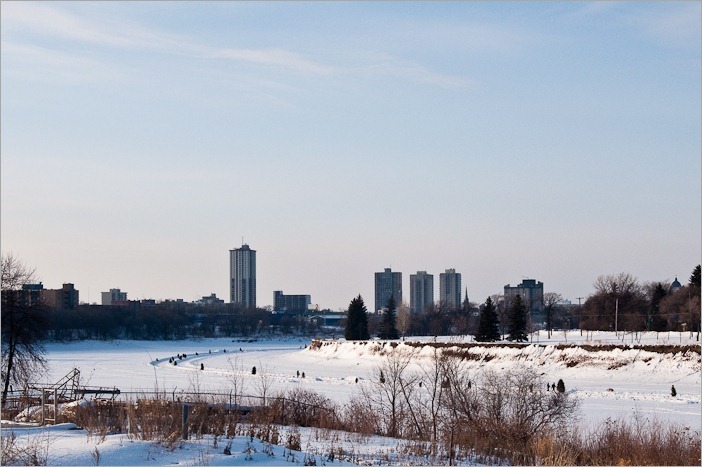 Holiday on Ice, Fish on ice, walking on ice, we can do it all in Winnipeg. In Holland, where I come from, we are happy if once in ten years we get 15cm of ice to hold the “elfstedentocht” a difficult but wonderful competition of skating on ice. Over 220km of natural ice must have these coveted 15cm, everywhere. Useless to say that that does not happen every year. 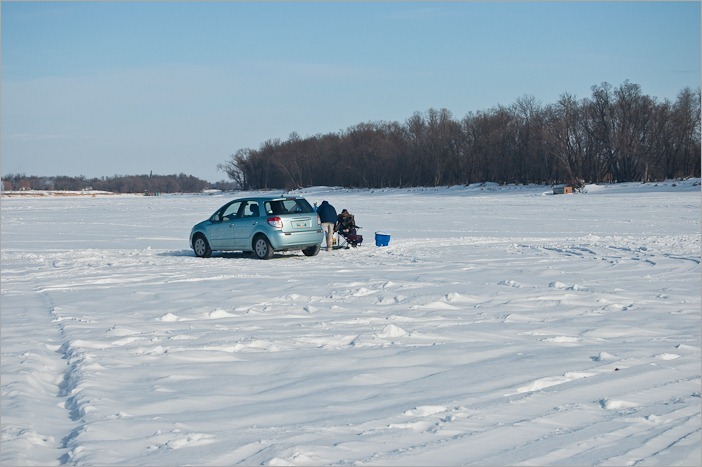 Here we parked our rental car on the ice, in order to do some ice fishing. Didn’t catch anything, but it was a fun day. And the ice? Well if there is less than two feet (60cm) of it, you don’t try to park your car on it! So, what else do we do on ice here? Skating, Skiing, Bicycling, it all can be done on the ice with more or less success. But before we can do some skating, we need a trail. No, not because we’re sissies and need a predefined trail so we don’t get lost! It’s more because of the fact that skating on 30cm of hard snow on top of that ice is not the most comfortable. Even more, the ice may not be in such a good shape to skate on. This winter, the trail started in very bad shape. So, here’s the material. Not the big heavy 6 tonne ‘dozer, but one that will do the job nice and quietly. 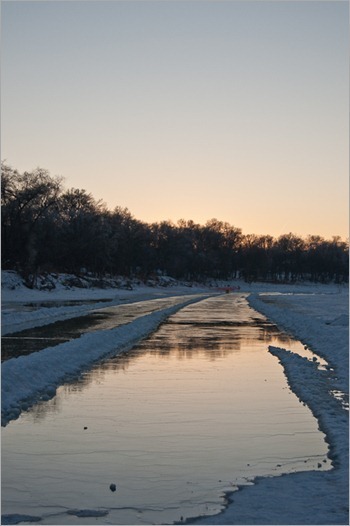 With this, a trail is created and the crumbled ice is flooded by the evening. 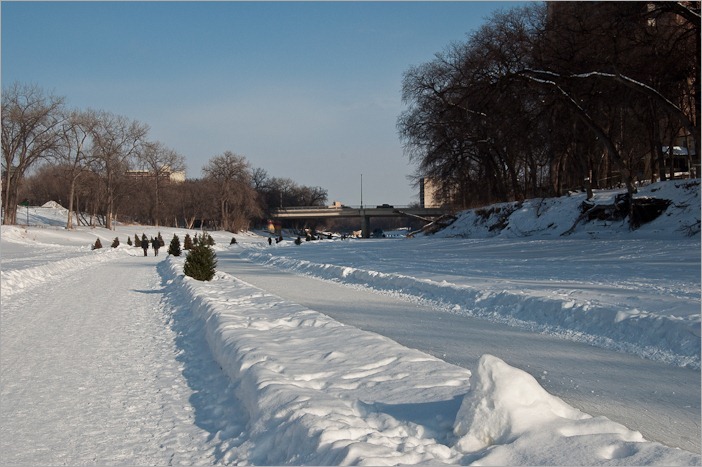 The next day we can expect a nice ice floor, good enough to skate on. 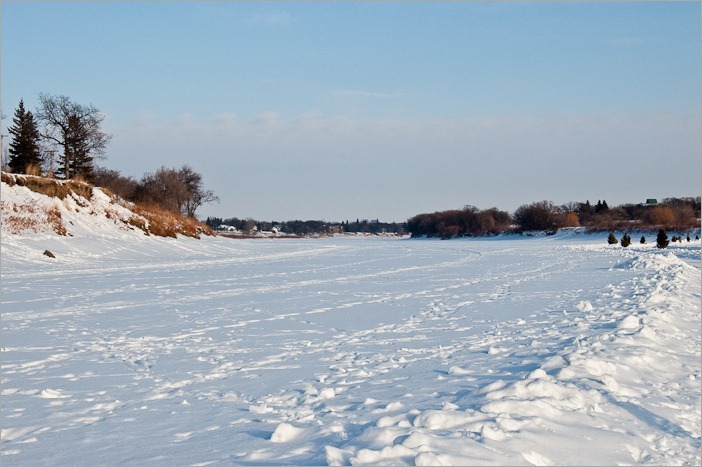 So, for those who still want to go skating for miles on end, well, this year we decided to go south on the Red River instead. This one is a lot deeper and less likely to freeze shut. Ice enough, here too the thickness of the ice is around 2-3 feet, nearly 1m of ice. 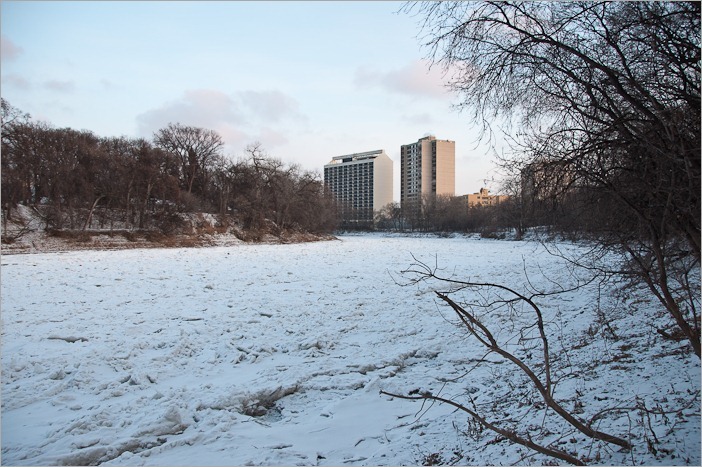 While the Assiniboine river keeps a rather cozy character, not too wide, not too cold (apparently, at least on pictures) the Red is completely different. The Red river is wide and rather uninviting at first sight. Due to its size, the wind blows a lot more and frostbite in the cold is a real danger. Keeping yourself covered enough is something you really need to think of. But when you do go out on the Red, well, in some places, even if the trail has been made by bulldozers/bobcats, it looks really peaceful and sleepy. With the right angles and crop to keep out the telephone poles and the houses, it may seem that the Red still offers the same views to us as it did to the trappers 300 years ago. The trees you see at the right on the above picture do not grow there… They’re there to shield the skaters from the wind while changing their skates. The silence is great at this spot, you only hear the wind around you. 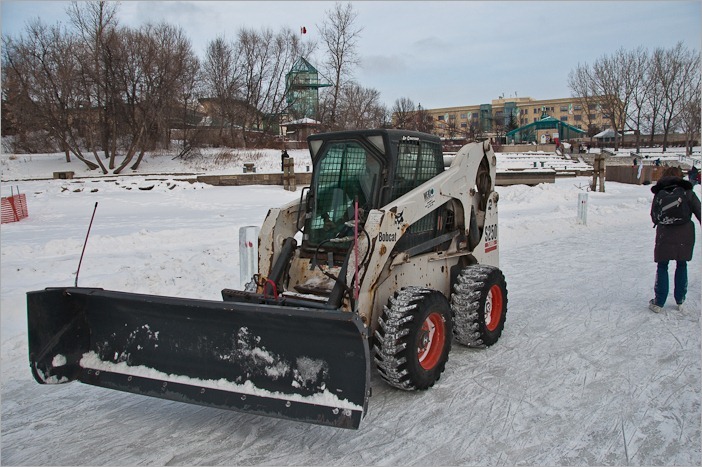 If you don’t turn around to see the houses and businesses boarding the river, you might feel yourself a trapper, yeah, like the one of 300 years ago. 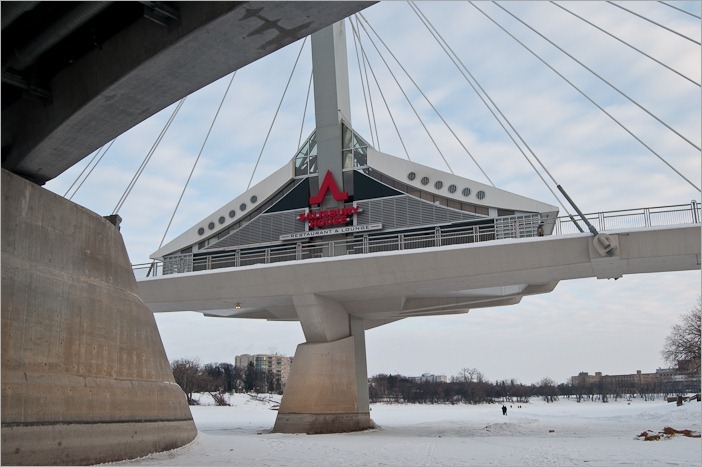 Of course, if instead of going south on the Red from the Forks, you go north, then you have no way of missing one of Winnipeg’s “own” chains of restaurants on the Provencher Bridge. Quite far away from the quietness the south part of the river offers you. I guess that there must be something for everyone. Oh, yes, for those who still want quietness even at Sal’s… this particular spot is closed for the winter season.